Sometimes you just need to see what something looks like before you can commit to it, and when a car is involved that ‘sometimes’ turns into ‘all of the time.’ Be it an individual, a shop, or a manufacturer, no one wants to throw money away for an end result they aren’t happy with. But what if you aren’t a rendering wizard like Khyzyl Saleem, Ash Thorp or Aaron Beck, and you don’t want to spend the sort of the budget a shop or manufacturer might have? The answer is an obvious one, a platform we’ve all surely tinkered with at one time or another: Need for Speed. While Sander mentioned that his love for cars stemmed from childhood hours behind a controller, he recently put the game to a more practical use. 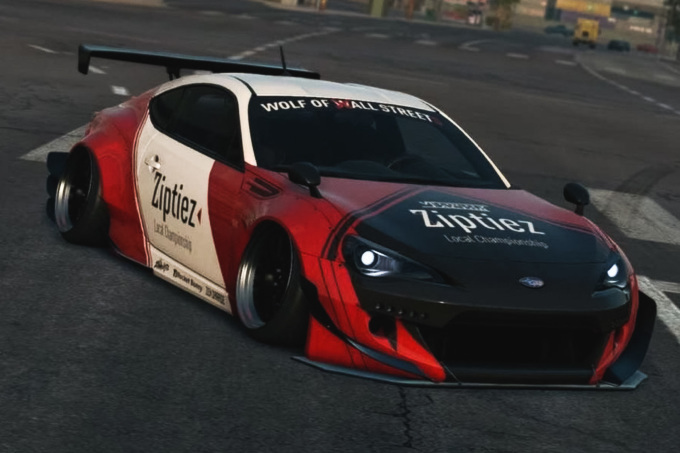 With the ability to add a plethora of real-world parts, wheels, wide-bodies, and experiment with custom liveries, Sander created this car – based off one of Khyzyl’s renders – in NFS first. The wrap was all roughed out, and then Sander took the dive and brought it to life in the real world. This is the result of his tinkering, an 86 that definitely looks like something that came out of a videogame. Of course, with an Instagram name of 86 Akira you know straight away that Sander’s taken cues from other mediums as well. While the renders Sander used to hone his vision and create the next iteration of his car were all done in the Need for Speed 2015 game, he redid it in NFS Payback as well and sent me this screen-cap after I hung out with him and his car. 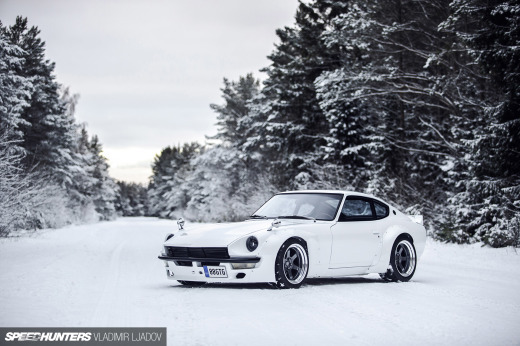 If you check out his Instagram you should recognize a previous Speedhunters-related theme too. 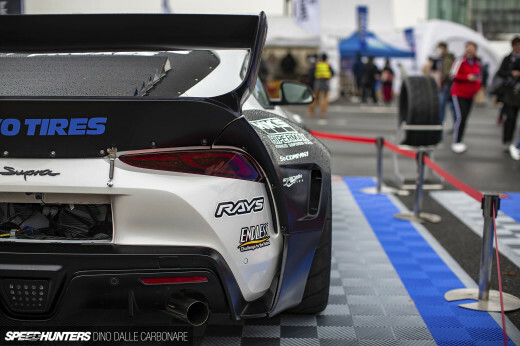 Sander’s owned the car for three years now, and after reaching this evolution of the build his next move will be sourcing full-on functional aero. While he’s tracked the car before, he wants to move to a time attack spec build while maintaining street functionality. As far as the aesthetics, Sander wrapped the car himself after completion of the livery design, and I love the way the material accentuates the V3 Pandem wide-body. 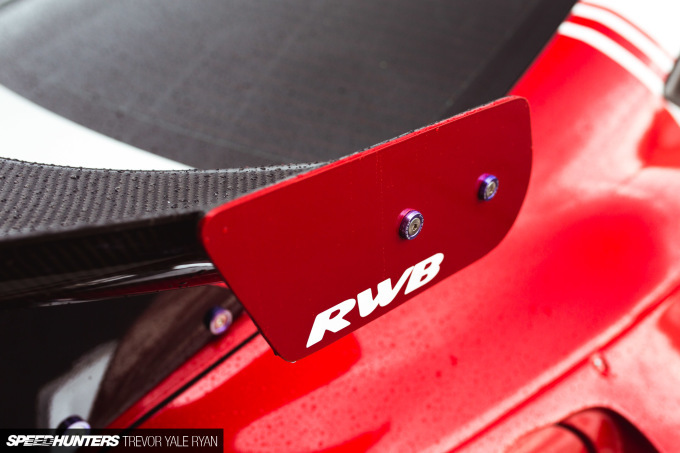 Sander’s also gotten his hands on an RWB wing as he’s always been a fan of Nakai’s work. 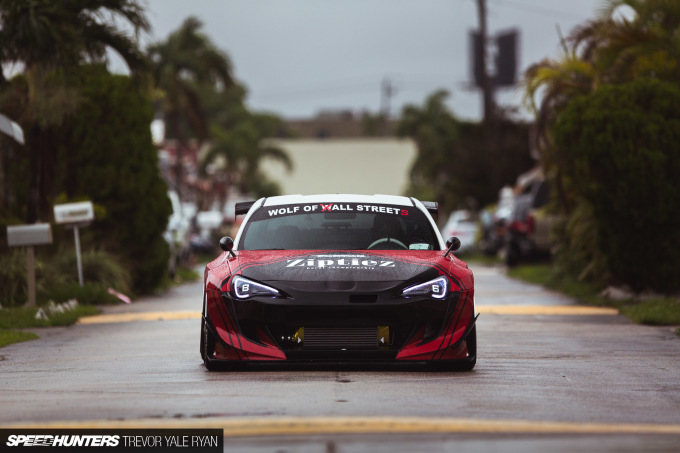 He tells me it’s his favorite single piece of the build, and again we find RAUH-Welt Begriff ideals where at first they might not seem to belong. The wild design theme continues inside the car. Sander’s gone with a gold and white DND Performance steering wheel that, like his shift knob, would be quite gaudy in almost anything else. With a Cypher harness bar allowing safe use of a Takata Racing 4-point harness it’s the best of all worlds in the cockpit. 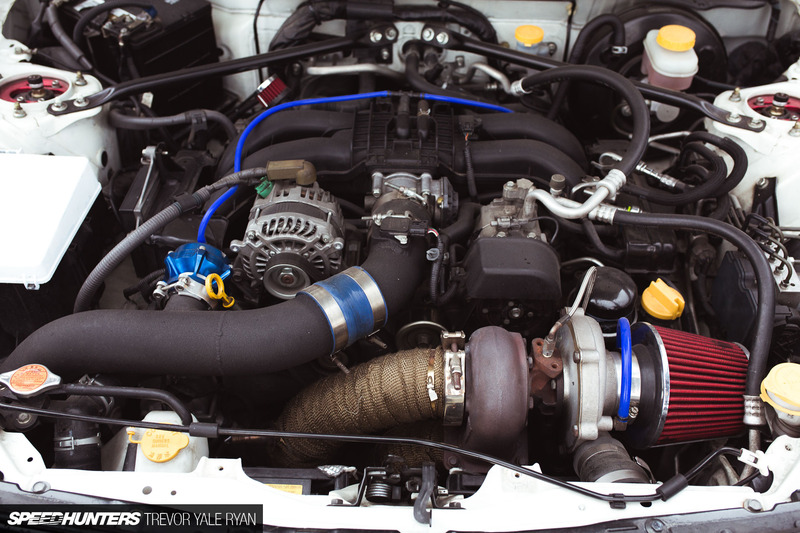 Under the hood a 58mm Precision Turbo kit has been mated with the 4U-GSE boxer four, giving the FR-S the pep it always needed. With a K&N air filter and Borla exhaust, Sander’s been able to have the car tuned for just a hair over 300whp and 270ft-lb of torque. To achieve the car’s stance Sander’s used a set of Megan Racing coilovers, although he plans to go through the suspension for the car’s next iteration. Still, it’s not so low that Sander can’t find his way around town, and he plans to maintain this when he goes full track-mode. Perhaps a set of air cups will need to find their way into the setup for help over speed bumps and driveways around Miami. But for now just the coilovers alone paired with the ISS Forged custom three-piece wheels and Hankook Ventus V12s make for a fun street setup that can handle track use when Sander feels like it. It’s certainly cool to see the car on the street, and I hope Sander maintains the street-ability into the future. If you’re wondering about the helmet, it’s a Scorpio Exo and part of the theme of the car; Sander wears it for photos and sometimes at shows. 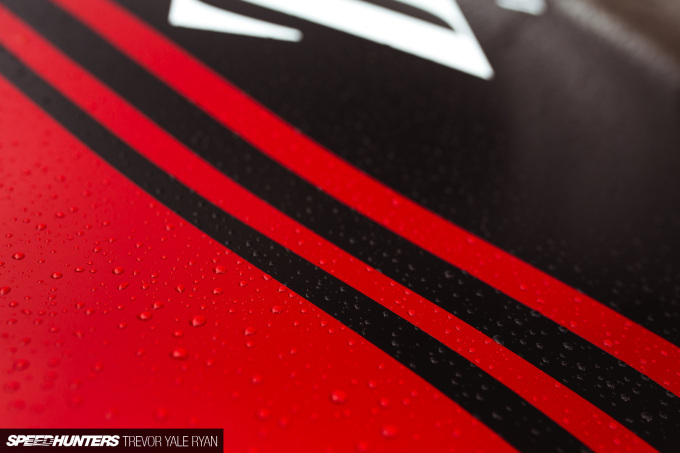 All in all, the 86 is a wild build that gets plenty of looks wherever Sander takes it. While we were shooting near his house, neighbors couldn’t help but wander through the photos and come out for a look in the rain. 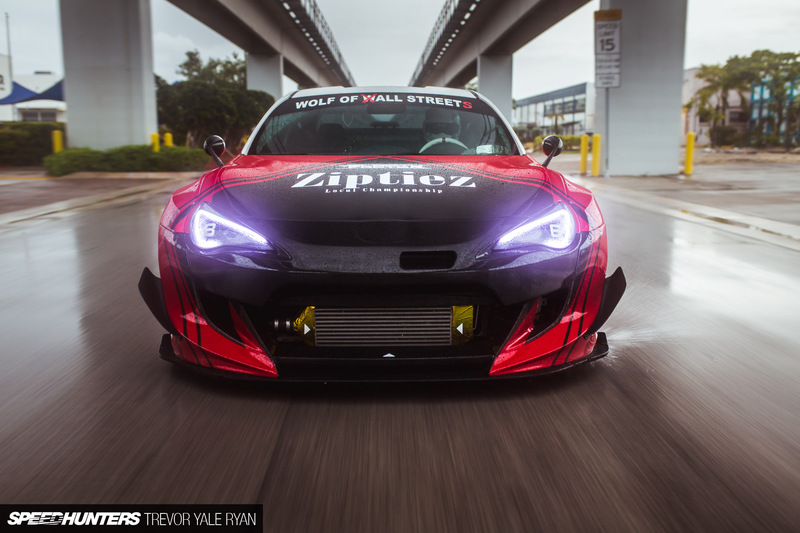 Like many others, Sander loved the lines of the 86 when he first saw it, and immediately after getting his hands on this car he started modifying it. 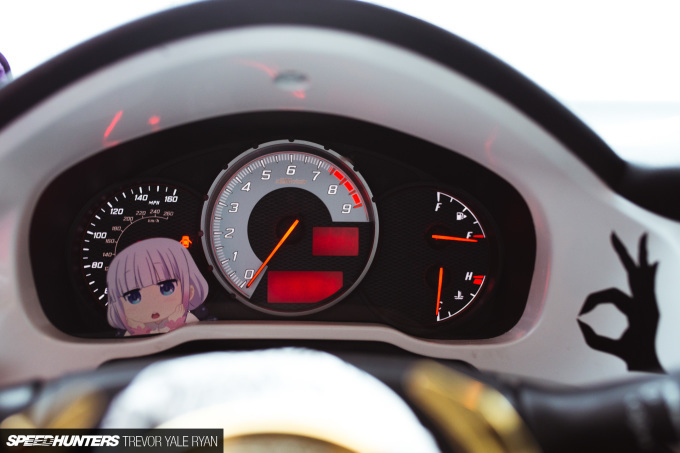 The reality is that he’ll probably never stop; after going all-out with the car in Need for Speed and falling in love with the digital build, he’s been heading down this path ever since. Sander’s using his car as a platform to expand his creativity and build something unique with the performance to match. 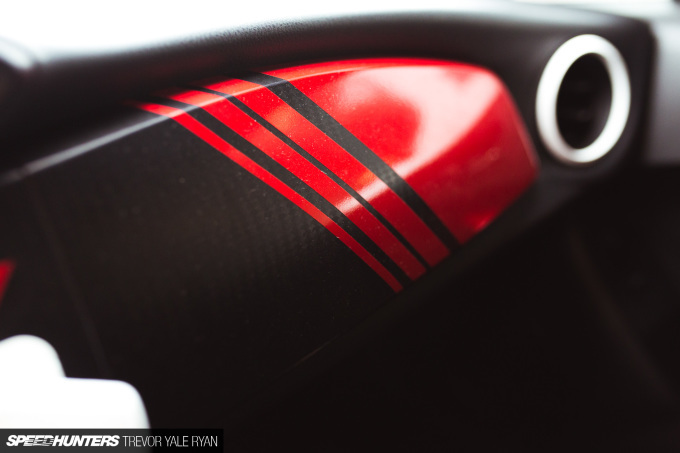 At this point the FR-S has a personality of its own. 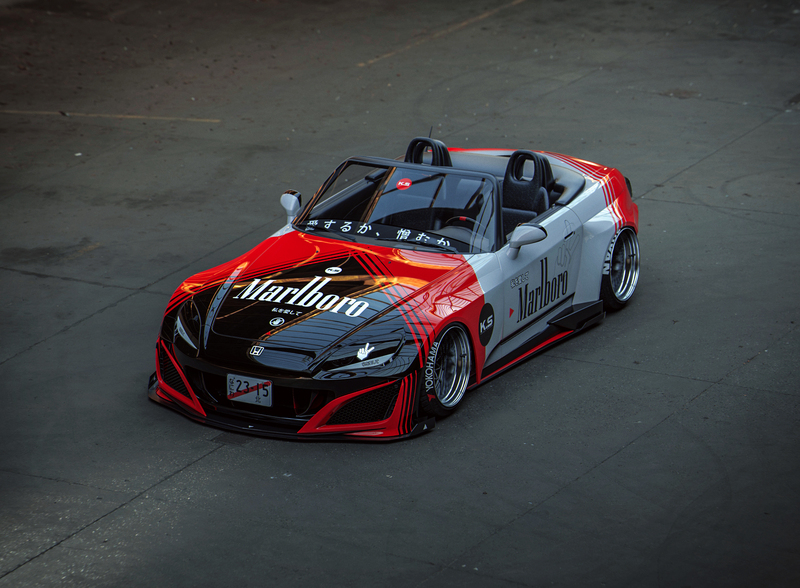 I enthusiasticly support this car and the mentality behind it. Fun stuff. Well, it definitely proves that everyone has their own unique taste. The turbo looks objectively good, however. I have seen this car in person and it is a work of art. Congratulations to its owner. 8:37 amJune 12, 2018 Will? Glad it's not stock under the hood, neat idea for a project too. This 86 is mean....but I expected a lil more power for it's menacing appeal. 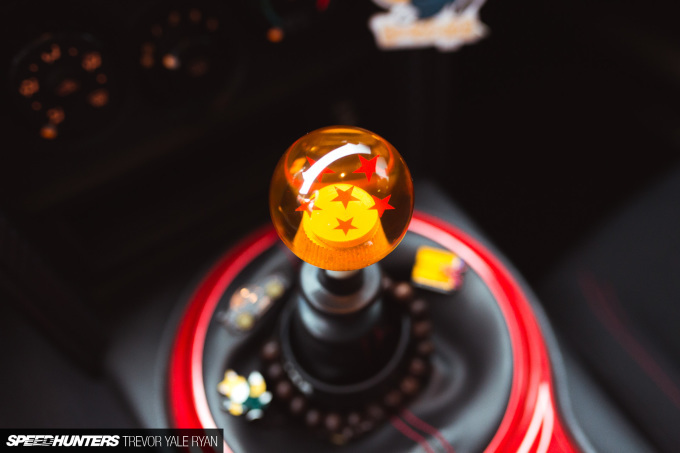 With the exception of the DragonBallZ shift knob and the gold with white steering wheel I think this is the BEST LOOKING GT86 I have ever seen! I love the touch on wrapping the interior matching with the exterior! Also, should probably add some power or maybe a swap? 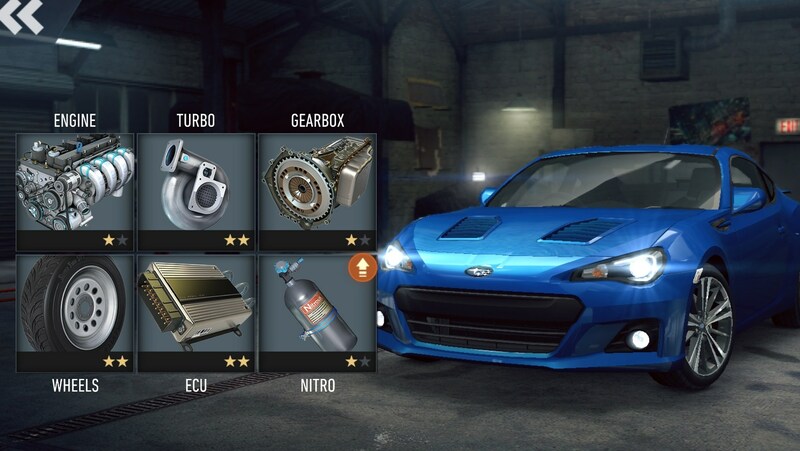 The most unique item in this 86 is not mentioned in the article. 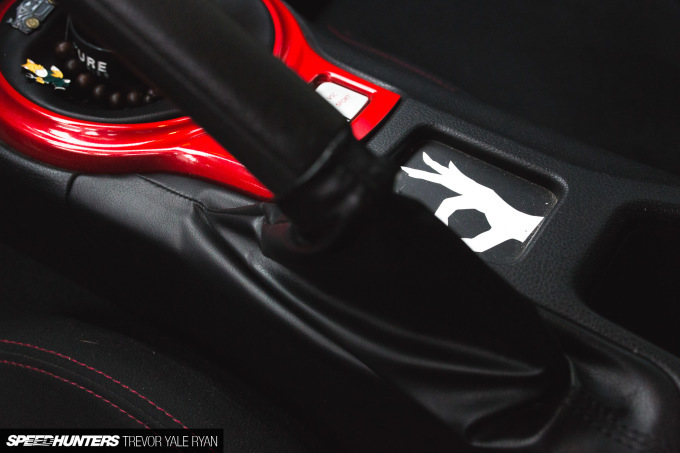 While i've seen a lot of Rocket Bunny 86s (and i admit the interior is unique) but i'm all in with the fender mirrors, i've never imagined a new car fitted with them and the best part is that it seems at home. Very nice car, i would only change the steering wheel (too much for me). That is a incredible build, looks really great. 300whp is plenty to have fun, I don't see why it would need more, but nowadays people focus more on the number and less on the actual drivability... And seems like this car is all about it, actual drivability: a static stance that isn't too low, just the right amount of power to have fun and I guess everything else is on par performance wise. But the aesthetic part of the build is entirely up to the owner, and I personally like what he has done here (apart from glossy white the steering wheel, but hey it's his car !). Congrats to him, he really made something unique ! 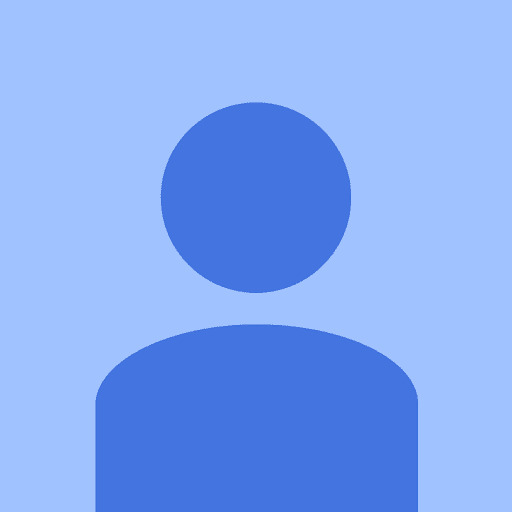 Wow, your comments is as empty as the void between your ears. If you don't have anything relevant to say, better say nothing. It made me laugh though. A wonderful story that Toyota needs to read. Storm regalia? Is that an Air Gear reference?? The fender mirors look absolutely amazing, as does the RWB spoiler. Those 2 elements really tie the build together for me. I love this car. The wing sets it off perfectly. I dig the interior style and the vinyl is spot on. Very cool build.